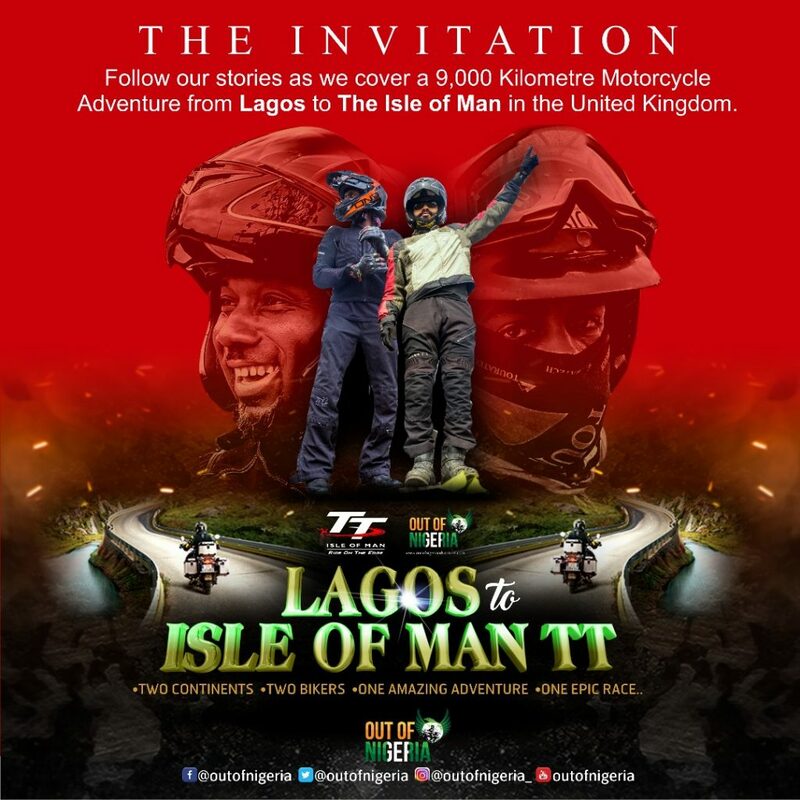 In the wake of May 8, 2018, another epic journey begins for Toyin Adebola and Dele Fadimiluyi of Out of Nigeria Motorcycle Adventure Group as they embark on a 9,000 Kilometers Motorcycle Journey from Lagos to the Isle of Man , United Kingdom, breaking borders through Benin Republic, Togo, Burkina Faso, Senegal, Mauritania, Morocco and Europe, to experience the oldest and unofficially the most dangerous Motorcycle Event on earth ,The Isle of Man TT happening since 1907. The TT Race (Tourist Trophy ) is an annual motorcycle sport event run on the Isle of Man since it’s inaugural race in 1907. It is one of the most challenging, famous and dangerous races in the world. The Isle of man has a long tradition with Nigeria due to King William’s College , a public school which had Nigerians in Its Alumni for the last 50 years. Out of nigeria is a Global Adventure brand that is based in Nigeria . It’s core passion is to use Motorcycle Adventure as a tool of positive change within Nigeria and around the world. Education and Passion are two powerful forces and this journey to the Isle of Man brings out the best of both. The journey across the Sahara from Lagos, the Western Coast of Africa, to the Northern coast Morocco will shine a light on the Migrant issues while raising awareness on the need to train and Mentor our boys with key focus on The Borstal Juvenile Home for boys, Ilorin. This institution is one of OON’s key Pet projects that provide Training, Sponsorship, Mentorship and Education for the Boys. To travel is to educate one’s self. African Adventure is one of the least great travel routes that has not been totally commercialised. This Motorcycle adventure will Educate, Inform and open up various possibilities while telling a true Nigerian story through the eyes of these two Epic adventurers. It will also carry the follow8ng public along while exploring unbelievable landscapes, experiencing varied cultures and food, facing unforeseen challenges. Join the community on social media to follow updates and see how Dele and Toyin embark on this epic adventure!! Have you been on Motorcycle before?